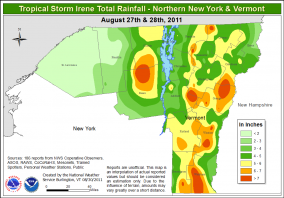 The catastrophic flooding from the rain bands of Hurricane Irene last Sunday and Monday was the second major flood in Vermont this year. The wet spring brought severe flooding on the Winooski River: Lake Champlain hit a record level and was above flood stage for about two months. Rainfall in Vermont during the months of March, April and May set a new record. Summer rainfall was above average, and the ground never really dried out. So my first thought when I saw the projected track of Irene up the Connecticut River was that severe flooding was a real threat. Indeed, when the strong easterly winds on the north side of Irene’s storm circulation hit our north-south mountain ranges they dumped 6 inches of rain, destroying roads and bridges, and cutting off more than a dozen towns. A week later, crews working 18-hour days have built temporary roads to allow emergency crews, supplies and people to get in and out. It is really too soon to draw lessons, but floods are a recurring feature of Vermont’s mountain terrain. We were surprised by the severity of this flood — perhaps because the media focused so much on coastal damage from winds and storm surges as the hurricane moved up the East Coast. 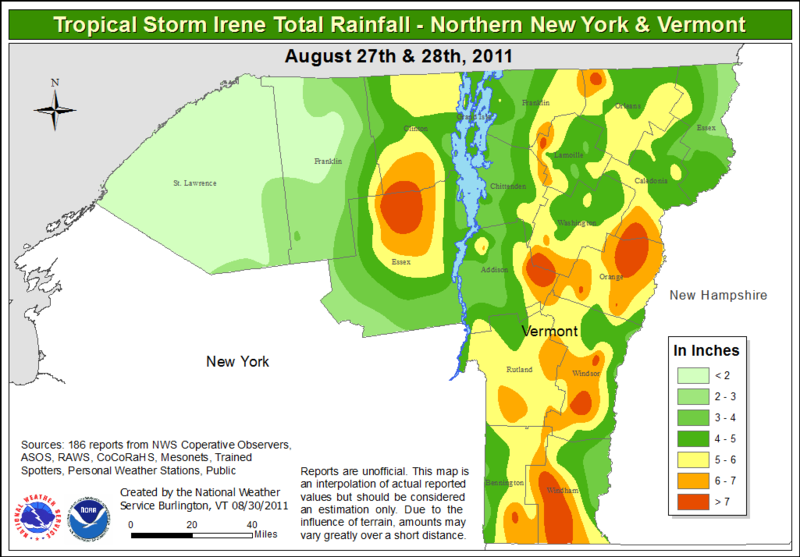 By the time Irene reached Vermont, it had been downgraded to a tropical storm and direct wind damage was small. But when 5 to 6 inches of rain falls on wet soils, mountains streams rise very fast and flood in a few hours. They feed into the larger rivers, which then take only a day or two to peak. Mostly people had time to evacuate, but what they had to leave behind was lost, as houses and businesses in the floodplain were swept away. A tropical storm in 1927 and the New England hurricane of 1938 also produced major floods in Vermont. Old-timers in Pittsford say that this August 2011 flood matched the July 1811 flood on the Otter Creek. Our road and rail networks now look more fragile than we had realized. This is because they lie in the mountain valleys, along the streams. When Vermont was first settled, some key roads ran over the mountains and not along the rivers, for just this reason. Of course, horses instead of cars were used for transportation then — much slower, but able to travel on washed-out roads and over the mountains in winter. When our roads wash out now, we have no backup method of transport — just a backpack, a few ATVs and some National Guard helicopters. Those walking the Long Trail got soaked last Sunday, but many will just have dried out and continued on foot, perhaps unaware of the floods beneath them. Our first tasks are to reach out to our flooded neighbors in need and help rebuild the current infrastructure that we depend on. But, where we can, we must rebuild with greater resilience in mind. Heavy rain events have become much more frequent in the past 50 years, and we expect this trend to continue as the climate warms. Some lessons are obvious — leave more room for flood waters. We must build bigger culverts and higher bridges, and build further back from the floodplains. Of course floodplains are good farmland, and now the farmers whose crops were washed away need our help. Our communities can draw many lessons on vulnerability and resilience from this 2011 flood. Secondary roads that have proved critical for access in this flood may need more attention. Backup water supplies have proved invaluable in some communities, like Rutland. The new alternative energy systems we are building should be able to function on a town-wide level when cut off from the Vermont grid. But our strength is our communities and our neighbors, as shown by the grassroots recovery effort that we are witnessing throughout Vermont.